Congratulations to Blake Shelton for being named Male Entertainer of the Year at last night's CMA Awards! 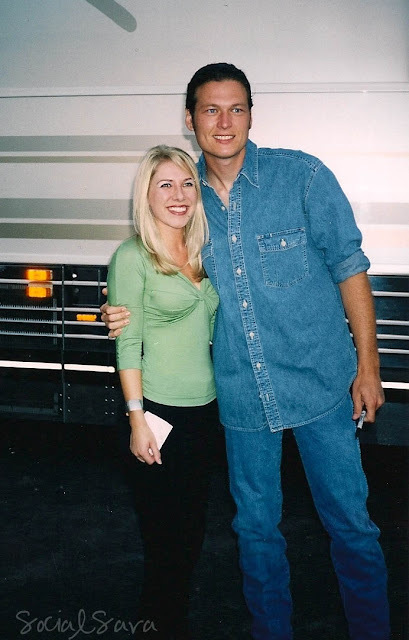 I had the opportunity to meet Blake and open for him at the North Georgia State Fair back in 2004. At the time, I had no idea that this nice, tall, talented vocalist would rise to stardom in just a few short years. It was an honor to meet and share the same stage with Mr. Blake Shelton! Congratulations to Blake and his lovely wife, Miranda, on two very big wins at the CMA Awards! Very Cool! Cute pic from the archives! I remember when all that went down. He was cute then but really good looking now! Congrats to both of them! Awesome that you still have the pic!